The fonts you use say a lot about you and your business There is a ton of material out there about fonts and which ones to use for your header bar, page and body headings as well as content. Let’s say you are an online social medium platform like LinkedIn. LinkedIn pretty much sets the standard for professionalism and it’s easy to understand their font choice. This sans serif font is clean and business-like, suggesting LinkedIn will help you attain your business goals. Google for example uses a serif font which is considered simple and respectable, and people are drawn to its playful likeability. 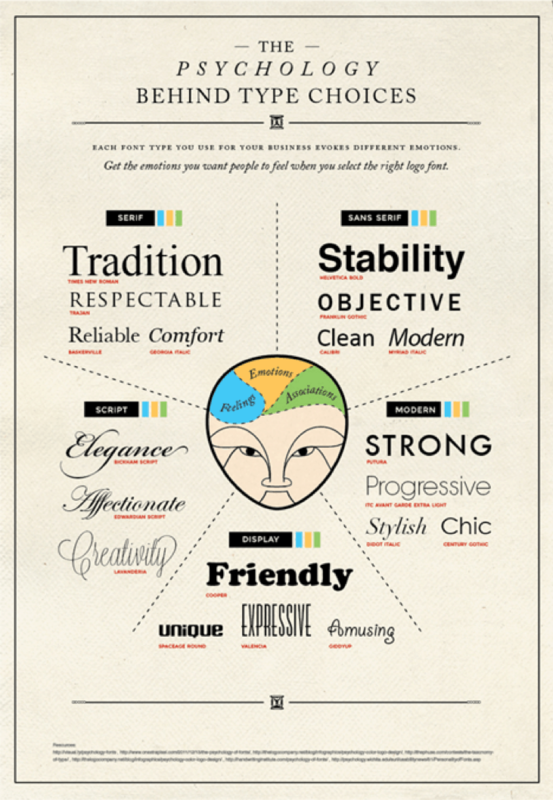 There is another image that we sure liked out there too, called ‘THE PSYCHOLOGY BEHIND TYPE CHOICES’, which we found on the site https://brandongaille.com/how-to-make-a-font-convey-emotions , see below. It is all over the web and a great resource, though now is a little dated. We like it as a visual reference as it highlights the emotions conjured by your choice of fonts. Have fun and go for it, you will start looking at fonts in a whole different way.